When Kyle Cook was a little kid growing up in Goldthwaite, Texas, his daddy was always building fires and loading meat on the smoker. Little did he know that years later the two would form a cooking team and travel together on the highly competitive Texas barbecue circuit. I’m walking through Richards Park in Brady Texas just ambling along trying to make one of my favorite days of the year last as long as possible. It’s Labor Day weekend in Brady Texas and that means it’s time for one of the biggest barbecue parties in the United States; The Annual International Goat Cookoff that was established way back in 1973. As I pass the Cook n Co barbecue team at the center of the park I notice a friendly looking stranger leaned up against a metal fence, a converted butane tank cooker nearby is loaded down with fat sausages sizzling over mesquite. I sidle up and we begin talking. When Andy Cook is not driving an 18 wheel Peterbilt truck across Texas and the rest of the USA he’s raising Duroc, Berkshire and Hampshire show pigs. He’s modest. When I make mention of his raising pigs he allows how he doesn’t really raise them, he just buys them when they’re piglets and nurtures them along for 9 or so months. Sounds like raising to me. Heidi Cook, Andy’s 15 year old granddaughter shows these pigs all over the state. She’s had grand champion Berkshire and reserve champion Durocs at some of the big livestock shows in Texas. My interest is piqued as my granddaddy, Big Jim Sullivan, was famous in southeastern Kentucky for raising Duroc hogs. He was the go to man for country hams in the region and any time I meet an old school pig man I get real interested. 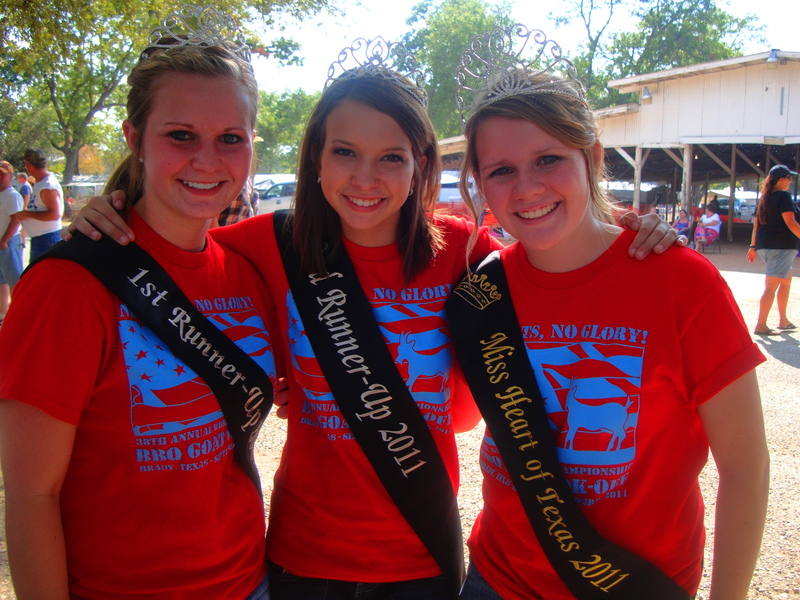 At the end of 9 months of careful nurturing the show pigs are taken to Hibler and Sons Slaughterhouse in San Saba. There, the show pigs are converted into delicious hams, slabs of bacon and those sausages that I haven’t been able to get out of my mind. I may never get them out of my mind. We stand with our arms leaned up against the fence for a bit, just wool gathering and passing the time of day, the smell of the sausage is driving me wild but I keep a poker face. I want some so bad I can’t stand it when all of a sudden Andy says “you want to try some of that sausage?” I nearly leap over the fence and snag a link with my teeth and gallop off through the nearby woods, but manage to contain myself and just nod vigorously. The old pit boss wraps me a sausage link in a flour tortilla, I bite in and almost lose my mind. It is delicious. It may be a Duroc or it may be a Berkshire, it’s hard to tell. But I can tell you it is profoundly good. Anytime I eat barbecue with this much talent backing it up I get real curious so I ask about Cook-N-Co and their successes on the Texas barbecue trail. Andy and his son Kyle have a handful of championships in both Brady’s regular goat cook off and the exclusive “superbowl” portion of the event where only former champions compete against one another. Hmmm, maybe this is a tip I can take away from the cook-off. Being a champion barbecue cook might be one of the keys to having a successful marriage. It sure as Hell couldn’t hurt. I take my feast standing and soon enough it’s time for us to say our goodbyes. This is why the Brady cookoff is one of the highlights of my year; good old fashioned conversation with salt of the earth Texas folks. I reckon they have enough beer and food for the entire population of McCulloch county should they all descend on their campsite. 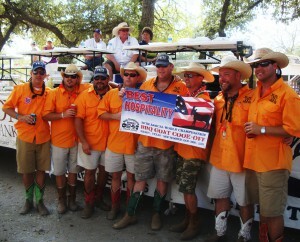 Which they may have done as this year the team beat all comers for the hospitality award. On one side of their site they’re having a fish fry, on the other they’re putting out burgers and dogs and in the middle everybody is concentrating on drinking as much cold beer as is humanly possible. It’s a good place. The company can’t be beat, there’s good music, giant trays filled with hot fried fish and everybody’s whooping it up without a care in the world. We look forward to seeing Waco Boys every year. But there’s a competition to judge so I break camp and make my way back to the judges table where I proceed to eat a few pounds of salmon [ this year’s mystery meat ] and of course several pounds of goat. Like any cook off I’ve judged, the quality ranges from phenomenal to downright awful. Some teams understand the value of keeping things simple while others try to overdo the seasoning and ruin their entries. The operation runs like a clock. With over two hundred teams it has to. Kathi Masonheimer, the community development director of Brady is in charge and this gal runs a tight ship. Big coolers filled with beer are lined up on the judging platform and a trio of gals repeatedly walk up to the lip of the trailer and ask after everyone’s weal. The goat meat comes in waves. 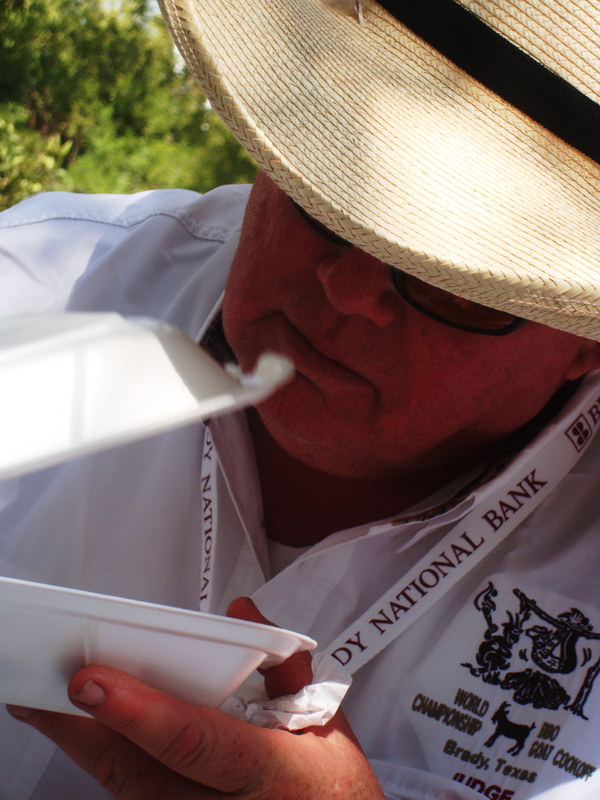 I notice one judge; Terry Keltz’s thoughtful technique of deeply inhaling just as he opens each sample box. Indeed, there is a solemness to the affair that is intriguing. This is serious business. Deeply inhaling from each sample is important as that tells you what sort of wood is being used. Mesquite and oak are the two most common but the unmistakably delicious scent of hickory is also noted. Finally, after much hard work the winners are tallied and three local beauty queens gather to present the awards. I’ve appended a list at the bottom of the top finishers. The aptly named Team Six Pack takes home best in show but as a local wag would have it, they might as well be called Team Twelve Pack as they’re missing in action. Some folks go run and get them and they hightail it to the awards area. The six Huerta brothers; Lupe, John, Vince, Fidel, Pete and Ed are on top of the world as the prestige of winning settles in on the group. Much hooting and hollering commences from the team and everybody is exultant. 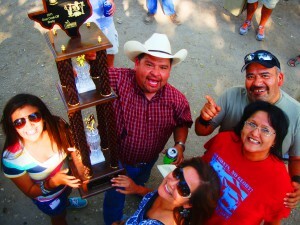 The Huerta family has been competing for ten years but this is their first victory. It’s a good scene. The most prestigious barbecue cookoff in Texas is in the books. After all this hard work I need to decompress and I know just where to go. Jade Hambright of Hambright Originals Cook Team always has a nice, relaxed camp set up with a few hundred cold beers and some good company to sit around with. We lounge back drinking and swapping stories for awhile, getting caught up as this is our one visit of the year. Bonding over the communal power of goat seems to be an overarching theme in Brady on Labor Day weekend. Day becomes dusk and there’s a concert by Johnny Bush to attend so I say my goodbyes. Leaving Richards Park just as the gloaming settles in always gives me a wave of nostalgia. This is the site of some of the best times I’ve ever had. While it’s certainly true that you’re never going to eat better and the cold beer does flow like water, it’s the people of Brady that make me want to come back year after year. 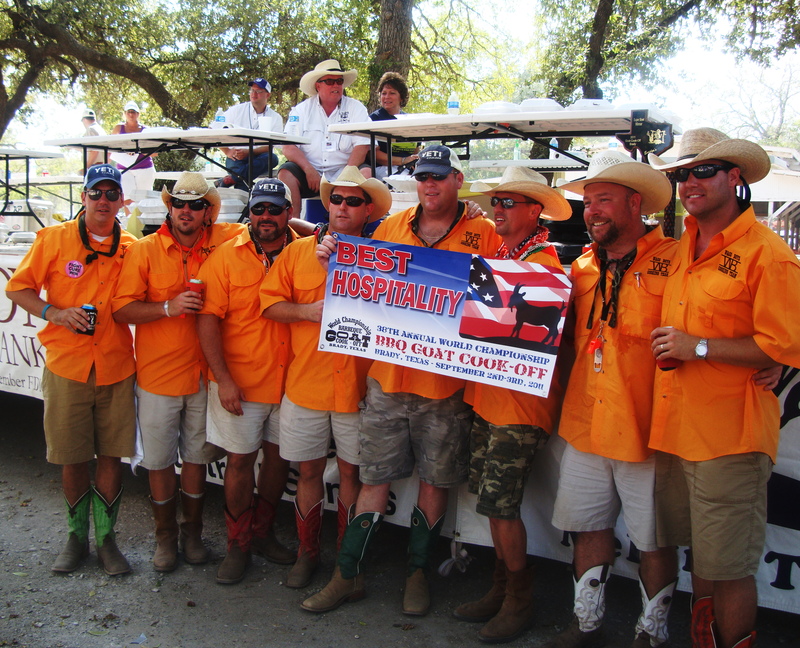 The art of southern hospitality is vanishing in USA but not in McCulloch County Texas where at least one weekend out of the year, thousands of strangers converge to the geographical center of Texas and throw one of the finest barbecue parties on the planet; the Brady Goat Cook Off. Hope to see y’all there next year. Little Lebowski Urban Goat Herders of Athens, Ga. 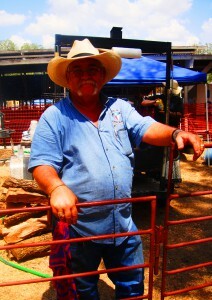 This entry was posted in Rural Texas, Texas Barbecue and tagged Brady Texas, cabrito, Cook Off, goat, McCulloch County. Bookmark the permalink.